These three Orders had followed the royal family at their emigration from Lisbon to Rio Janeiro, and were retained by the colony, after John VI. was recalled to the capital of Portugal. They became national in Brazil by decree, 20th October, 1823, and by subsequent usages. The insignia were only in so far altered that the crown of Portugal was exchanged for that of the empire (No. 7), and the borders of the ribbons of the Orders of Christ (No. 8), and St. Jacob (No. 9) were changed into blue, and those of St. Benedict (No. 10) into pink red. The Emperor is Grand Master, the Crown Prince first Commander. 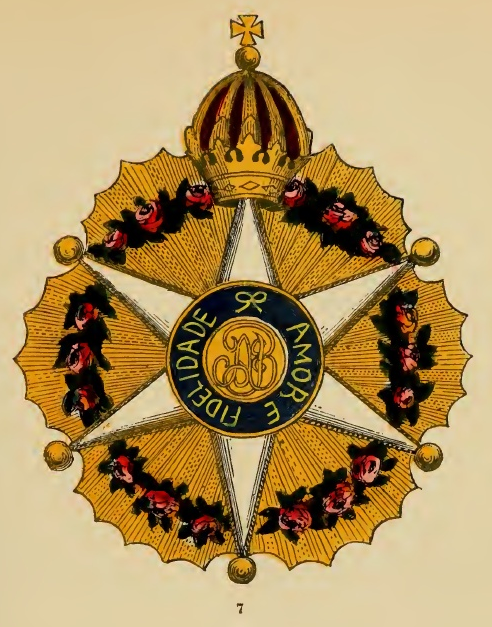 The Knights wear the Order at the button hole, the Commanders have the star upon the left breast, while the Knights of the Grand Cross wear, besides, a broad scarf on which the decoration is suspended. All these three Orders have, however, lost their religious character in Brazil, owing to her independence of Portugal, and the rejection of the Bull "Prseclara Portugaliae". They are now considered as civil Orders, and are presented to native as well as foreign subjects, who have done service to the state (Law 9th September, 1843).